Yuhi was born in Osaka, Japan. After graduation from University she moved to the Czech Republic. She has been living in Brno for almost five years and despite many barriers and difficulties she has successfully started her own business. Firstly she was involved in different business activities, however in October this year her dream finally came true. 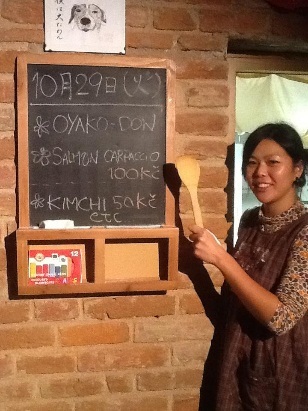 She opened in Brno Japanese fusion of a bar and a restaurant – Izakaya EBISU. There are places in Czech where you mainly go to eat like restaurants and places you go only to drink. In Japan there is also a category in between, casual places where you go to eat and drink – Izakaya. These are in fact the most popular, and this is where people head to relax with their co-workers and friends over a couple of drinks and tasty but inexpensive food. Why did you choose Brno? There is nothing like Izakaya in Brno. Many food places have the same menu. Still not so many options. I wanted to spread Izakaya culture where you can share the time, food, drinks and friendly atmosphere. Brno is a student city and it`s not that big. There is young energy, adventure. People are looking forward. Since when did you want to open your own business? Since my teenage years. I had a very good friend since childhood and we wanted to make food business together. Osaka is called „heaven`s kitchen“ and many people have this business mind. My friend`s mum had Izakaya called Ebisu. My friend later died. I wanted this name for Izakaya although my friend died. Ebisu is the name of the god. He brings a lots of luck, wealth and he is famous god in Osaka for food business. I like also his chubby character. Was it difficult to start a new business? The first problem was language. When I moved here I did not understand Czech at all. Also the culture is different. Even though many people in Brno speak English, if you don`t understand the language you do not get the meaning. So the communication was quite dificult. Later I went to language course. It was free for foreigners coming outside EU. Most of my classmates were working at international companies in Brno but soon they gave up. At the end of the course there was only me and my teacher. We often had lessons in pubs. Currently I can communicate and have basic conversations. Dealing with bureaucracy. The office things, papers, documents. If I wanted to do this alone, I could not make. The offices between themselves are not cooperating each to other. It does not go step by step. Here you go to one office, than another, than again the first one. It`s complicated, it takes time and I needed always Czech person to help with documents. What did you do before opening Izakaya? After graduating from University in Osaka, I moved to Czech Republic because of my current ex-boyfriend. To make living I was working in the pub and bistro and later i started my first business with Thai Yoga Massages. Firstly I worked for wellness centers and later I ran my own studio. At the same time I started to teach Japanese language. First privately and later at Masaryk University where I still give lectures. What should I do as a foreigner if I want to start my own business? You have to know the culture, language and bureaucracy. You must know how the system works. And you have to be patient. Everything takes so long time. You must also make connections. At the beginning my ex-boyfriend was taking care of all the things I had to do. Now I have friends and business partners who are helping with all that. What was the most surprising thing in the Czech Republic? People. At first I thought people are very cold here when I came for the first time, but since I understand the language now people are very kind. It really surprised me because I did not expect this. Now I believe Brno people are always open to new ideas, inspiring things, which makes people excited. It is a big advantage compare to other cities. On the other hand I wish people smile more often. Do you consider Brno has changed over the years? Yes. Definitely. Five years ago there was much less foreigners and now you can hear different languages on the streets. Also there are more shops, better services and it is much easier to access those services. Also the food business has changed. Compare to years ago there was not many options and for good services you had to pay a lot. But now it`s getting better. There is more competition so people think more about being special. Business competition is making the quality better. And also the customers are looking for something different too. What are your favorite places in the city and surroundings? In the city a lot of places, pubs, Vietnamese market at Olomoucka street, parks and forests. I like Brno as a student city with lots of young people and nature around the city which is easily accessible. Brno is second largest city in Czech. I`m from Osaka which is also second biggest in Japan. It`s kind of similar feeling. And what do you miss here? How to make Brno more attractive to foreigners? Public hot bath. Because in Japan they are everywhere. You rest and relax your body and mind through hot bath. Also different kind of restaurants and international places in Brno.